This fantastic fisherman basket is quite a “catch”. Hook, Line and Sinker Snacks Fishing Gift Basket is brimming with sinker snacks that are *reel* people pleasers. 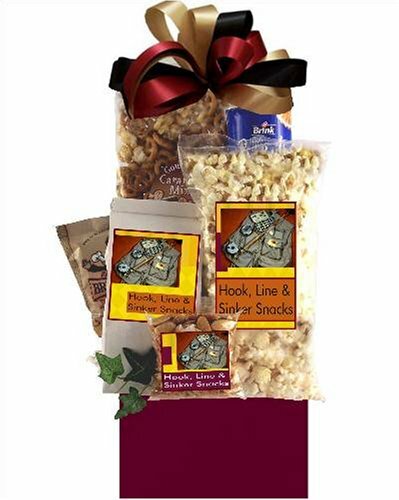 Sitting on the dock or out in the boat all day, they will love zesty popcorn, fresh roasted nuts, crisp cheese straws, decadent cookies, savory snack mix and scrumptious mini cookies. This will surely be the best gift anyone will get at the next Gift Exchange Party you will have. Or you could sponsor a fishing gift exchange and include this as the party treats. Gather the fishing group together and swap fishing gifts and tell stories about the big ones that got away.